With lasers starting to replace traditional lamps as the projector light source of choice, so the reliability of projector light engine is improving. 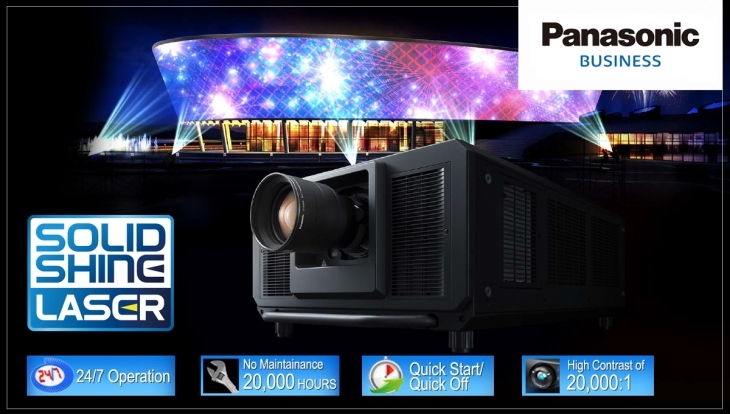 To reflect this shift, Panasonic Australia is now offering a longer warranty on SOLID SHINE laser-based projectors between 5000 lumens and 20,000 lumens. Instead of the standard three-year warranty, projectors in this range will now be warranted against failure due to defects in materials or workmanship for a period of five years*1. Not all laser projectors are created equal. Only Panasonic can deliver superior picture and the reliability that reduces your Total Cost of Ownership (TCO). With original SOLID SHINE Laser technology, you can enjoy up to 20,000 hours*2 of maintenance-free operations from your whole projector, not just the light source. Panasonic’s SOLID SHINE Laser is based on solid-state laser light sources and an all-new heat-resistant phosphor wheel. This dependable technology delivers exceptionally high brightness and resolution while limiting image degradation over years of continuous 24/7 operation. Image brightness and projector reliability is greatly affected by dust. Panasonic projectors are tested for dustproof compliance under extremely severe conditions. An airtight optical block makes SOLID SHINE Laser projectors ideal for use in harsh environments. Areas with high traffic (such as lecture halls and seminar rooms) rapidly accumulate dust, reducing picture quality and product lifespan. The SOLID SHINE Laser optical block—the heart of the projector—is airtight which extends life and maintains picture quality in locations with high dust contamination. The number killer of laser brightness output is temperature so Panasonic have developed a highly efficient cooling system. Our SOLID SHINE Laser projectors have unique cooling systems to suppress temperature rises and ensure stable operation. Selected models use a direct liquid-cooling system for the laser light source with a redesigned air intake and solid aluminium heat sink. This allows dependable operation in ambient temperatures of up to 50°C while once again increasing the product lifespan. *1 Five-year warranty applies to laser based projectors between 5000 lumens and 20,000 lumens. *2 Panasonic recommends cleaning at point of purchase after approximately 20,000 hours. Light source lifetime may be reduced depending on environmental conditions.